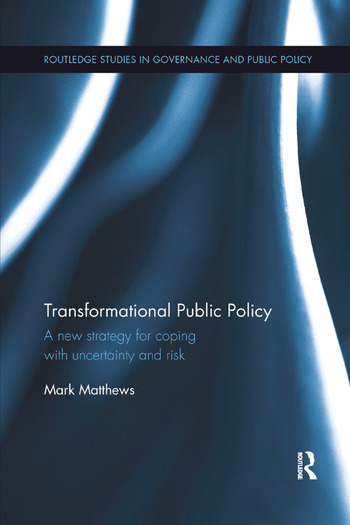 Transformational Public Policy examines how governments can more effectively handle uncertainty and risk in an uncertain and changing world. Unpredictable and changing circumstances often bring nasty surprises that can increase waste in governance and public debt. This book illustrates how new methods derived from signal processing techniques can improve the practice of public policy by transforming it through rapid learning and adaptation. Interventions are processes of discovery, not compliance. Transformational Public Policy shows readers how the power of hypothesis testing in governance can be deployed. The book argues that public policy can be framed as tests of competing hypotheses subject to diagnostic errors. The aim is to learn how to reduce these diagnostic errors through cumulative experience. This approach can reduce the impact of negative unintended consequences -- a topic of great interest to policy makers and academics alike. Mark Matthews is a public policy specialist who has worked closely with different governments from both private sector and academic bases. He has a background in science and innovation policy and is particularly interested in the consequences of shortcomings in the ways in which governments approach uncertainty and risk – and what could be done to address these problems.